Gagné, Michel. "Hochelaga". The Canadian Encyclopedia, 23 May 2018, Historica Canada. https://www.thecanadianencyclopedia.ca/en/article/hochelaga. Accessed 26 April 2019. The term Hochelaga historically referred to an Indigenous village the French explorer Jacques Cartier (1491-1557) visited on Sunday, 3 October 1535, during his second voyage in what is now Quebec (1535-1536). Hochelaga is an Iroquoian term which is either a variation of the word osekare, meaning “beaver path,” or of the word osheaga, which translates as “big rapids.” Today, Hochelaga refers to islands at the confluence of the St. Lawrence and the Ottawa rivers, as well as various electoral and city districts. In Giovanni Battista Ramusio's work, Jacques Cartier and his men are shown being welcomed at the entrance of the village of Hochelaga. 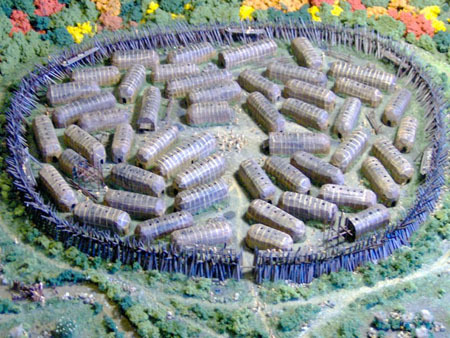 Historical model of the Hochelaga village, created on the basis of archaeological findings and interpretations. Hochelaga is an Iroquoian term which is either a variation of the word osekare, meaning “beaver path,” or of the word osheaga, which translates as “big rapids.” Europeans used the term to refer to an Indigenous village the French explorer Jacques Cartier (1491-1557) visited on Sunday, 3 October 1535, during his second voyage in what is now Quebec (1535-1536). On that day, he and his crew landed at the currents of Sainte-Marie, near the actual location of the Port of Montreal. According to the famous explorer, the village of Hochelaga was located on the island of Montreal, “about a league and a half” (approximately 8 km) inland from the docking point, and was surrounded by corn fields extending in the vicinity of Mount Royal. In addition to using the term Hochelaga to refer to the Indigenous village, Cartier also used this place name in his second narrative to name the St. Lawrence River (rivière Hochelaga), and in his third narrative to designate the region of Montreal (pays d'Hochelaga). During his second voyage in 1535, Jacques Cartier also visited Stadacona, another Iroquoian village, located at the present site of Quebec City. According to Cartier, the village of Hochelaga was round in shape and counted about 50 houses. These measured approximately 15 meters in length by 3.5 to 4.5 meters in width; they were made of wood and were covered with larges slabs of bark that were sown together. The village was surrounded by a palisade made up of three rows of wooden stakes that were driven into the ground. These rows were 15 meters high and were intertwined using sections of bark and large trees. Cartier also noted the presence of galleries above the only village entrance as well as along the fortification, where pebbles and rocks were stacked to be used as an active defense against invaders. There was also a central place, where Cartier spent most of his time during his few-hour visit to Hochelaga. Cartier only briefly described the interior of the houses, mentioning that there were several rooms as well as a central space with a fireplace for socializing. The upper floor was used for storing food, and the smoked fish was kept in containers on the ground. Cartier’s description and the archaeological investigations carried out at other village sites, including those of Mandeville and Lanoraie in Tracy, and Droulers, McDonald and Mailhot-Curran in the St-Anicet area, suggest that the village of Hochelaga was linked to the occupation of the area by the St. Lawrence Iroquoians, a group of Indigenous sedentary farmers who inhabited the St. Lawrence Valley between 1200 and 1600 CE. When Samuel de Champlain travelled to the region in 1603, the village of Hochelaga and its inhabitants had disappeared, possibly because of diseases transmitted by the Europeans, wars of conquest initiated by other Indigenous groups, or the control over trading routes with Europeans. To this day, no physical evidence of the ancient village of Hochelaga has been found. Cartier wrote about it in a document following his second voyage (1535-1536). The version that was printed in 1545 and presented to Francis I, King of France, is titled Brief recit & fuccincte narration, de la nauigation faicte es yiles de Canada, Hochelage & Saguenay & autres, auec particulieres meurs, langaige, & cerimonies des habitans d'icelles: fort delectable â veoir (loosely translated as Short and succinct narrative of navigation to the islands of Canada, Hochelaga & Saguenay & others, including particular customs, languages & ceremonies of the islanders: very delightful to see). There also exists a detailed plan of the old village that was drawn a few years later by Giacomo Gastaldi (1500-1566) and printed in the work of the Venetian Battista Ramusio (1485-1557), titled Delle Navigationi and viaggi (Of Navigation and Travel). However, according to the narratives of other missionaries and explorers as well as archaeological evidence from other Iroquoian villages of this period, this plan, which was partly based on Cartier’s description, is unrealistic. In fact, several details, such as the presence of a central square place and especially the symmetrical layout of the houses, are biased and reflect the European perspective on urban planning during the Italian Renaissance. Another peculiarity is that Cartier only mentioned the presence of a single fireplace in one of the rooms located at the centre of the household, whereas typical longhouses of this period normally included an alignment of several fires stretching down a long central corridor. 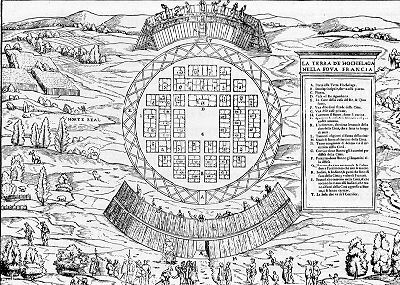 To add to the confusion, during his third voyage (1541-1542), which led him once again to the island of Montreal, Cartier did not in any way mention the existence of Hochelaga but referred instead to a village named Tutonaguy. This village was located in the same area as the village of Hochelaga Cartier previously described, suggesting that Tutonaguy was the name the Indigenous people used to designate the place. On the other hand, the term Hochelaga was probably used to designate the Montreal area or the region’s inhabitants. Since a significant portion of the original manuscript of Cartier’s third narrative is missing, however, our understanding remains limited. Therefore, Cartier’s description of the village of Hochelaga does not correspond exactly to the ethnographic evidence available about Iroquoian villages from this period. It is worth noting, however, that he was first and foremost a sailor who mainly travelled for commercial purposes. As a result, his writings primarily aimed at describing the characteristics of geographical features and cultural customs as a way to document and anticipate obstacles that could arise during the exploitation of local resources by the French. Even though the exact location of the village remains unknown, Hochelaga was designated a national historic site in 1920 and a commemorative plaque was erected near the main entrance of McGill University on Sherbrooke Street, Montreal. Today, the term Hochelaga also refers to a group of 234 islands located at the confluence of the St. Lawrence and the Ottawa rivers (Hochelaga Archipelago), to a district of the city of Montreal (Hochelaga-Maisonneuve), to provincial (Hochelaga-Maisonneuve) and federal (Hochelaga) electoral districts, and to a street and a park in the City of Montreal. In 2017, a movie directed and written by François Girard — Hochelaga, Land of Souls — connects local histories with contemporary Quebec in a tale of historical fiction. Screened at the Toronto International Film Festival, Hochelaga, Land of Souls won four Canadian Screen Awards and was submitted for Best Foreign Language Film at the Academy Awards. Olive Patricia Dickason, Canada’s First Nations (2002). JACQUES CARTIER Watch the Heritage Minute about French explorer Jacques Cartier from Historica Canada. See also related online learning resources. MONTREAL GAZETTE Read Marian Scott’s article, “Mystery of the missing village of Hochelaga persists” (2015). CTV NEWS Watch a brief video and learn more about archeologists’ efforts to find Hochelaga.